The name’s Bland. James Bland. At least it is when Ales Kot is writing him! Bond fights an assassin. Then a terrorist. Then some Nazi arms dealers. He chills out with some lady in the mountains. He fights another bad guy. And that’s James Bond: The Body. Still awake? Me too - barely. This anthology is sooooo unimaginative - Bond by-the-numbers. It was kinda shocking to see Bond waterboarding someone (does Ales Kot even like Bond? Why is he writing this comic - Kot seems very anti-authoritarian t The name’s Bland. James Bland. At least it is when Ales Kot is writing him! Bond fights an assassin. Then a terrorist. Then some Nazi arms dealers. He chills out with some lady in the mountains. He fights another bad guy. And that’s James Bond: The Body. Still awake? Me too - barely. This anthology is sooooo unimaginative - Bond by-the-numbers. It was kinda shocking to see Bond waterboarding someone (does Ales Kot even like Bond? Why is he writing this comic - Kot seems very anti-authoritarian to me) but otherwise the stories here were instantly forgettable. Dull writing, very weak characterisation all round and the art is nothing special. Ales Kot is Borefinger – he’s the man, the man with the snoozy touch! “Whatever glamour we see in Bond—it’s not worth the price”—Ales Kot So this is book seven in the “new Bond” Dynamite comics series, the intent of which is to bring Bond up to the present, offering various artists’ takes on how to bring the tone of the original, Ian Fleming's Bond and not the Sean Connery film Bond, into contemporary Bond stories. In some ways all of them can be seen as reflections on Bond and Fleming. For instance, in this and some of the other Dynamite comics volumes James Bond “Whatever glamour we see in Bond—it’s not worth the price”—Ales Kot So this is book seven in the “new Bond” Dynamite comics series, the intent of which is to bring Bond up to the present, offering various artists’ takes on how to bring the tone of the original, Ian Fleming's Bond and not the Sean Connery film Bond, into contemporary Bond stories. In some ways all of them can be seen as reflections on Bond and Fleming. For instance, in this and some of the other Dynamite comics volumes James Bond is much more violent than in the squeaky clean films, and more of the brooding existentialist you find him to be in the early Fleming books. Yes, James is also a “woman’s man,” in some of the books, but he’s also more of an invent-your-survival killing machine than an MI6 Mr. Suave Martini Gadget Guy. More of a bourbon man, yes, but also less escapist fun we have associated with the Bond franchise. This more tortured Bond is the Bond Kot is interested in. So as you can imagine, some of these twenty-first century Bond tales are a mixed bag. The best of the bunch so far has been the volume of Warren Ellis, imo. But this very volume is one such mixed bag itself, written by Ales Kot, and drawn by different artists. There isn’t an attempt to make the art styles sync in any way, or to even make the Bonds look alike. He’s on steroids/testosterone in the contemporary fashion in one, then leanly muscular in the next. That is clearly deliberate in this volume; the thing that unites all the stories is that they were written by Kot and that each issue features action in terms of Bond’s body, as in The Heart, Lungs, and so on. It takes an opportunity to reflect on Bond and his legacy. Each volume is connected to injuries he has suffered, which correspond with psychological injuries. The last story is an attempt to tie things together, connect them all to one larger story of Bond and The Damage Done. There’s a tone in Kot’s writing here I was having trouble fixing on that I was helped with by reading the afterword, where Kot says of Bond that he is an “imperialist, colonialist construct,” and also racist and misogynist, too, in that he is a white man who uses women of various ethnicities “without regard to their well-being.” Now, Bond as lover is one of the chief reasons both men and women (okay, more men than women, at a glance at the Goodreads ratings/reviews) read Bond, so we are getting into touchy territory here, I know. But Kot has his various points to make, and he makes his various them throughout this volume without losing sight of him as a human being. So I reread it from the perspective of his afterword and I began to understand what he was doing. Example: Bond is working undercover at some soiree, out to find a guy who is going to try to kill a woman. Bond’s protecting this woman. We don’t know why the guy would kill the woman or why Bond would protect her. At one point another woman calls him a “hunk meat mountain.” I almost stopped reading right there, I’ll admit it, on first read. Why, that isn’t Bond language! Or, on reread, maybe it is, in that when Bond walks in the room women all turn their heads, and he makes his choice of them if wants to. He’s a body, and “his” women are bodies. And Bond in this first issue is not the lean Sean Connery, but is seen here almost as Thor and Hulk are depicted, and even Batman now, with monster pecs and arms. He’s the contemporary muscular hyper-masculine male. He’s male eye candy; he’s a body! On reread I see Kot as deconstructing him in an anti-colonialist fashion. Bond figures out who is the assassin, in a room full of white rich people. Why, surprise, it is as it was in Fleming’s day as he wrote it, the swarthy dark-skinned guy! So Bond kills this guy, saves a rich woman, and Bond finds a note on the guy, a goodbye note explaining why he happened to be doing this hit job--forced to do so through poverty and strong-arming, and telling his family he loves him. This part of the story would not have happened in Fleming books--sympathy for the assassin, seeing things from his point of view. But afterwards, Bond feels badly about having killed this guy. When the doc offers him pain meds he declines: “I want it to hurt.” In another issue or chapter here, Bond actually waterboards a woman who is critical of England’s continued colonialist legacy, from 1763—when England gave blankets infected with small pox to indigenous Americans on orders from military high command--through Margaret Thatcher to Brexit. The woman says to Bond: You just follow orders, doing what the government wants you to do, right? You’re part of this “great country.” Whew! Political critique in a Bond book??! I can see why this is a low-rated Bond book, because it is actually a critique of Bond as unquestioning imperialist representative, but it is good and interesting as a fresh angle. And you know, it is also part of Fleming's Bond. In another issue/chapter Bond is talking to a bunch of white nationalist arms dealers, and (spoiler alert), Bond ends up slaughtering ALL of them. Would James Bond do this?! Well, Fleming’s Bond WAS very violent, not the suave Connery that was more a lover than a fighter. But we see what the legacy of violence might have been for secret agents like 007 who only get assigned those numbers IF they are killers. Bond pays for killing, in body and soul, but he also IS a killer. Do we really want to slaughter all the neo-Nazi haters out there? In the final chapter there’s a chat in a pub between fellow agent Franz Leiter and Bond as Leiter arranges for a guy to be killed in the pub. The guy dies, and they go on drinking. There’s a certain level of anguish, depression, existential angst in this volume that you find in the early Fleming Bonds—or in Goldfinger, where there is an extended meditation on death, and what it means to kill people and have your own brushes with death. Kot in places is not unsympathetic to Bond, the killing machine; he finds him complex, both troubling and troubled. So, again, the Goodreads rating for this is low as I said and I’m not surprised. There’s not much fun action, because it's not, when you come down to it, really fun action to kill people. There’s a lot of talk, because this one is primarily reflective. It’s a very dark socio-political commentary on Bond in the current climate, with neo-Nazis, extra-judicial torture, and the world going to hell. I have already begun reading Goldfinger (for the first time) and will not be able to keep this critique out of my head as I read on. I think Kot is brave and smart to have done this work WITHIN a Bond series! I can’t say I loved it, but I admire the heck out of it. Congratulations Ales Kot. You've managed to make James Bond boring. Six loosely connected solo stories, most of them consisting of sitting around talking and Kot isn't enough of a wordsmith to make that interesting. But even the issues that feature more action like when Bond is chasing after a guy with a bomb aren't interesting due to the obtuse narration. This just doesn't feel like Bond. In fact, if Bond's name was stripped out of this, you'd just think this was another generic spy thriller wr Congratulations Ales Kot. You've managed to make James Bond boring. Six loosely connected solo stories, most of them consisting of sitting around talking and Kot isn't enough of a wordsmith to make that interesting. But even the issues that feature more action like when Bond is chasing after a guy with a bomb aren't interesting due to the obtuse narration. This just doesn't feel like Bond. In fact, if Bond's name was stripped out of this, you'd just think this was another generic spy thriller written by Ales Kot. There's a different artist on each issue with varying degrees of skill. Received a review copy from Dynamite and NetGalley. All thoughts are my own and in no way influenced by the aforementioned. This is really good. A series done in a style similar to Kot's Zero, with each issue featuring artwork by a different artist, and an episodic nature tied to a different part of Bond's body--heart, lungs, etc.--as he takes part in a mission or recovers from one. The various stories don't seem to have any connection to each other until the final chapter, featuring Felix Leiter, suggests that they all relate to a single conspiracy, which Kot explains in an interview in the extras, he might come bac This is really good. A series done in a style similar to Kot's Zero, with each issue featuring artwork by a different artist, and an episodic nature tied to a different part of Bond's body--heart, lungs, etc.--as he takes part in a mission or recovers from one. The various stories don't seem to have any connection to each other until the final chapter, featuring Felix Leiter, suggests that they all relate to a single conspiracy, which Kot explains in an interview in the extras, he might come back and follow up on in another series. Here's hoping he gets the chance. This is one of, if not the best Bond series that Dynamite has put out to date. Strong recommendation. I received this from Netgalley in exchange for an honest review. This is the seventh volume of the James Bond series, and it keeps getting better. In this volume, we get even deeper into the psyche of Bond as he tries to unravel a tangled web involving Afghan assassins, deadly biological weapons, neo-Nazi gangs, supersmart scientists switching sides, and of course, EU and American politics. It was also quite cool how the author tied it all into injuries that Bond has experienced. The spying game isn't as glamorous as it seems. Five apparently unconnected tales, each centered on a body part, before they all tie up at the end. Each tale focuses on some of Bond's pains. Be they physical or not, they hurt him, day by day, bit by bit. Because of his acute understanding of who he is, of what he does and to which endgame. No fancy cars, casinos and martinis here, only the dark and lucid take of one man on his life, on his job, on his depression-while saving a few thousand lives. The spying game isn't as glamorous as it seems. Five apparently unconnected tales, each centered on a body part, before they all tie up at the end. Each tale focuses on some of Bond's pains. Be they physical or not, they hurt him, day by day, bit by bit. Because of his acute understanding of who he is, of what he does and to which endgame. No fancy cars, casinos and martinis here, only the dark and lucid take of one man on his life, on his job, on his depression-while saving a few thousand lives. For 007 is not a happy man. A good modern approach of Bond. Darker and more self-reflective than usual, it does a great deal to humanize our secret agent without sacrificing the plot. The weak point is the cast of pencillers: with the exception of Luca Casalanguida (opening and closing issues) they are all very mediocre and make for a good story but a rather ugly comic book. I've never been a James Bond fan. Never grew up with the character, other than playing Golden Eye. I got bored too quickly with the marathons. What seemed so stylish THEN seemed so dated to me me Now. My other exposures had been through other media, such as Casino Royale via the book, the parody and the recent film--which I actually enjoyed. In many ways, James Bond was wish-fulfillment that I didn't wish to embody. He was tall, annoyingly charming. Catch my surprise with this recent spat of qual I've never been a James Bond fan. Never grew up with the character, other than playing Golden Eye. I got bored too quickly with the marathons. What seemed so stylish THEN seemed so dated to me me Now. My other exposures had been through other media, such as Casino Royale via the book, the parody and the recent film--which I actually enjoyed. In many ways, James Bond was wish-fulfillment that I didn't wish to embody. He was tall, annoyingly charming. Catch my surprise with this recent spat of quality writers--with Warren Ellis, and now Ales Kot. Kot writes the character if he caught a bit of self-awareness. Awareness that he's part of the military industrial complex, awareness that he's a womanizer and a perhaps a misogynist, and that he has a duty to QUESTION Queen and Country. The fact that this is now canonical, and not just an emulation (i.e. Kingsman, Zero, etc.) makes it all the more special. The character has actually been allowed to grow, imo. Rather than put back in the box and just come back shiny, new and different every few years. Let's hope these "changes" stick. What a ride. Kot is a great choice for writing the acerbic and disgruntled Bond, especially since he seems to have free reign in this series. The tone jumps with each issue, going from somber to funny to heartbreaking and then back again. Ales manages to deliver more quotable lines in 6 issues than Diggle did in 12. Definitely up there with Ellis among the Bond comics. For more reviews and bookish posts please visit: http://www.ManOfLaBook.com James Bond: The Body by Aleš Kot (illustrated by Luca Casalanguida, Rapha Lobosco, Valentina Pinto, Tom Napolitano and Eoin Marron) finds secret agent 007 recounting how he got each cut and bruise on his last mission. This graphic novel collects the six issues which make up The Body story-line. Issue #1: The Body – James Bond tells the story of his previous mission to a medical examiner. Each bruise and bump has a connecti For more reviews and bookish posts please visit: http://www.ManOfLaBook.com James Bond: The Body by Aleš Kot (illustrated by Luca Casalanguida, Rapha Lobosco, Valentina Pinto, Tom Napolitano and Eoin Marron) finds secret agent 007 recounting how he got each cut and bruise on his last mission. This graphic novel collects the six issues which make up The Body story-line. Issue #1: The Body – James Bond tells the story of his previous mission to a medical examiner. Each bruise and bump has a connection and a purpose – either to kill or to save a life. Issue #2: The Brain – In this issue Bond interrogates a scientist who let a terrorist organization steal a lethal virus. Issue #3: The Gut– To find the virus, Bond has to infiltrate a group of Neo-Nazis who intend on selling the weapon. Issue #4: The Heart – Bond finds himself without weapons, and wounded, in the Highlands. A woman who chose a solitary life helps him heal and Bond finds that he likes the peaceful place. Issue #5: The Lungs – The story now comes together in a terror attack – maybe! Issue #6: The Burial – James Bond meets his old friend and CIA counterpart Felix Leiter in a pub where the secret agent must face the consequences of his actions. I started reading this graphic novel thinking this would be another secret agent on a mission story but instead I got an excellent James Bond arc. 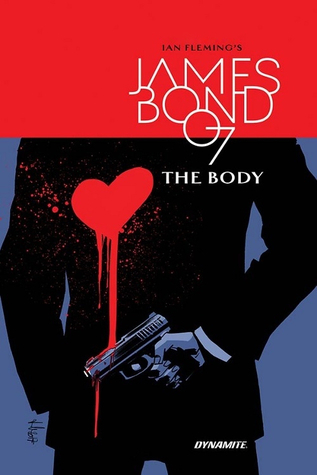 James Bond: The Body by Aleš Kot (illustrated by Luca Casalanguida, Rapha Lobosco, Valentina Pinto, Tom Napolitano and Eoin Marron) is something different and deeper than the previous graphic novels. The story is clear and concise, there is no outrageous plot to take over the world, and there are no beautiful women to save (or kill when they eventually backstab Bond). This story is grounded and fresh, the comics work together to bring a cohesive story to life. The writer shows how Bond struggles with the decisions he makes and the actions he takes. He knows he will pay for bad decisions his superiors make, yet he executes his mission faithfully. Bond also sees another side of life, one that doesn’t have people who want to kill you behind every corner, and that tranquility might actually work for him at some point. The audience certainly gets the feeling that Bond is tired, mentally and physically broken from the world he lives in. This arc is a change of pace for the series, and goes in its own direction. The art in this graphic novel is a mixed bag, the story is really good but the backdrops seem to be boring (a sauna, house, pub) which is exactly the time for the artist to shine. Hmmm… I thought I was going to get more out of this book – but then I started without knowing it was designed to look like six short stories. The end result is sort of six short stories – and kind of not, and either way there are problems. You have to take the comment that the first part is relevant with a pinch of salt, and while the tale meanders through its distinctive parts, you get too much that is a beat away from the full rhythm. So the conclusion of the bit with the woman is stupid ("oh Hmmm… I thought I was going to get more out of this book – but then I started without knowing it was designed to look like six short stories. The end result is sort of six short stories – and kind of not, and either way there are problems. You have to take the comment that the first part is relevant with a pinch of salt, and while the tale meanders through its distinctive parts, you get too much that is a beat away from the full rhythm. So the conclusion of the bit with the woman is stupid ("oh by the way, I'm only here to prove a woman can spend the night with you with her knickers on" she might as well have said), the bit where he goes full-on Punisher is stupid, and I could also have done with the snide comments about Brexit, too. Stupid. But at the same time, by the time everything is wrapped up, it's proven itself to be OK. It's one of those books where you think it's being lame, but have to give it the benefit of the doubt. It's more interesting than entertaining, as a result, giving us more character than action – so I'd say try it, but don't rush to buy, unless you feel compelled to for completism's sake. The hardcover collection of THE BODY brings all 6 issues together in one volume. It is satisfying to see that almost every issue presents another artist's rendition of our contemporary hero, James Bond. The collection allows you to read just one issue (as a complete story) or continue on and read all six. I was interested by the different approaches the artists had to drawing Bond. I really liked the scientist who is being questioned for her apparent malfeasance. These stories are not as fantasti The hardcover collection of THE BODY brings all 6 issues together in one volume. It is satisfying to see that almost every issue presents another artist's rendition of our contemporary hero, James Bond. The collection allows you to read just one issue (as a complete story) or continue on and read all six. I was interested by the different approaches the artists had to drawing Bond. I really liked the scientist who is being questioned for her apparent malfeasance. These stories are not as fantastic as the cinema movies of Bronson and Moore, but they present a contemporary, intelligent figure. I enjoyed the series so much that I had to read it over once I completed the first run-through. Now, I'm still reading it but slower as I try to savor the nuances Ales has created for the character and the situations. If you're a Bond fan, this collection belongs in your library. Fragmented stories that focus on the psyche and inner workings of Bond. Somewhat connect together in the last issue, but the arc as a whole is certainly more therapy insights than plot-driven storylines. Much of the series takes place in the calm before the storm or recovery discussions between Bond and other characters. Kot does a great job at addressing current events as they might impact Bond/spies, but some of it is certainly heavy-handed. Of the 7 or so arcs of Dynamite’s Bond series, this Fragmented stories that focus on the psyche and inner workings of Bond. Somewhat connect together in the last issue, but the arc as a whole is certainly more therapy insights than plot-driven storylines. Much of the series takes place in the calm before the storm or recovery discussions between Bond and other characters. Kot does a great job at addressing current events as they might impact Bond/spies, but some of it is certainly heavy-handed. Of the 7 or so arcs of Dynamite’s Bond series, this is middle of the pack in writing and slightly below that in art. Review copy courtesy of NetGalley and Dynamite Comics. six separate stories that revolve around the toll being James Bond takes on his body. The Body, The Brain, The Gut, The Heart, The Lungs, and The Burial, each with a different artists but all scripted by Kot as Bond stops an assassination, interrogates a subject, infiltrates a neo-nazi arms ring, recovers from an assassination attempt in a remote location, stops a potential bio-terror attack, and meets Felix Leiter for a couple of drinks at a London Pub where more is happening than meets the eye six separate stories that revolve around the toll being James Bond takes on his body. The Body, The Brain, The Gut, The Heart, The Lungs, and The Burial, each with a different artists but all scripted by Kot as Bond stops an assassination, interrogates a subject, infiltrates a neo-nazi arms ring, recovers from an assassination attempt in a remote location, stops a potential bio-terror attack, and meets Felix Leiter for a couple of drinks at a London Pub where more is happening than meets the eye. Dynamite continues to provide entertaining Bond stories with a Fleming feel set in the current world. Aleš Kot provides a different slant on James Bond. He opens with Bond in the doctor's office, being examined and repaired after a mission where he saved a woman from an assassination. He interrogates a rouge scientist, disrupts arm sales, and domestic terrorism trying to be performed on EU officials and London. Then over a drink with Leiter, they discuss the interconnection of the seemly random cases and what they can do about it. The story line is solid, but the changing faces of James Bond was Aleš Kot provides a different slant on James Bond. He opens with Bond in the doctor's office, being examined and repaired after a mission where he saved a woman from an assassination. He interrogates a rouge scientist, disrupts arm sales, and domestic terrorism trying to be performed on EU officials and London. Then over a drink with Leiter, they discuss the interconnection of the seemly random cases and what they can do about it. The story line is solid, but the changing faces of James Bond was off-putting. But a nice addition to the Bond comic line. Writer Ales Kot has used an anthology format to tell an interesting story about ace assassin James Bond. The six stories, revolving around the murderous machinations of a shadowy (is there any other kind?) American corporation are cleverly tied together in the final, fifth chapter of this graphic novel, featuring Felix Leiter. Only the segment featuring Nazis in the sauna keeps this from being rated five stars. Each chapter of "The Body" features a different artist, among whom Hayden Sherman sta Writer Ales Kot has used an anthology format to tell an interesting story about ace assassin James Bond. The six stories, revolving around the murderous machinations of a shadowy (is there any other kind?) American corporation are cleverly tied together in the final, fifth chapter of this graphic novel, featuring Felix Leiter. Only the segment featuring Nazis in the sauna keeps this from being rated five stars. Each chapter of "The Body" features a different artist, among whom Hayden Sherman stands out. This was a very boring read and I found myself wishing I was over it. The only scene that was my favorite was when he killed all of the Nazi's. The art work was badly done as well, a lot of the time I couldn't tell the tone of the story due to the characters having no emotion on their face. Not sure if the stories connect fully because it seemed kind of all over the place. I received a copy of this book via NetGalley in exchange for an honest review. James Bond: The Body by Aleš Kot et. al. is a free NetGalley e-comicbook that I read in late October. Bond going over and confessing the cause of his injuries, wound by wound, to his doctor, then fighting bio-warfare terrorists and neo-Nazis, and coming to terms with being a spy (particularly not having a ‘normal’ life or to be able to pursue love or justice in a smaller, less earth-shattering way). Exactly the kind of tired, bitter, traumatic, anti-Imperialist stuff the Bond movies will never be. This doesn't have the subtlety or thematic weight of, say, the Bourne movie trilogy - my favourite of this severely limited genre - but it's still essentially exactly the kind of Bond story I wanted. What happens when the tool questions its function? A brilliant deconstruction of Bond that continues to re-imagine bond for the 21st century as Ellis and Diggle have done previously. While there is an overarching story, each issue stands by itself and is illustrated by a different artist. The result is a Bond struggling with himself as a deals with the fallout of Brexit, resurgent neo-nazis and thinly veiled private contractors. Bloody okay It is a bloody and brutal story albeit a rather shallow one. Illustrations are okay but has good coloring and tone. Since Vargr came out from Dynamite Comics I have been picking up these collected editions once they release them in hardcover. I don't like waiting for the individual issues and as a big James Bond fan I want the collected editions so I can read the whole arc and also keep them as part of my library. This one has an interesting conception as it deals with the scars that the main character has and how those weigh on his body but also his mind. The way the author weaves all of these ideas in the ar Since Vargr came out from Dynamite Comics I have been picking up these collected editions once they release them in hardcover. I don't like waiting for the individual issues and as a big James Bond fan I want the collected editions so I can read the whole arc and also keep them as part of my library. This one has an interesting conception as it deals with the scars that the main character has and how those weigh on his body but also his mind. The way the author weaves all of these ideas in the arc can feel a bit disjointed from one story to the next but when you pull back and look at it I think the pieces fit together and tell an even larger point when taken together. If you are a James Bond fan these are a must buy/read in my opinion. The Body is Book 7 in the James Bond series comprising four stories. The first story opens with Bond’s doctor giving him a medical exam. He asks Bond how he sustained his injuries. Told in four separate issues, Bond goes on to explain what happened during his missions including an assassination attempt, a deadly virus, and his encounter with Neo-Nazi gangs. Gorgeous artwork which complemented the story well. I received an ARC from NetGalley and Dynamite Entertainment in exchange for an honest rev The Body is Book 7 in the James Bond series comprising four stories. The first story opens with Bond’s doctor giving him a medical exam. He asks Bond how he sustained his injuries. Told in four separate issues, Bond goes on to explain what happened during his missions including an assassination attempt, a deadly virus, and his encounter with Neo-Nazi gangs. Gorgeous artwork which complemented the story well. I received an ARC from NetGalley and Dynamite Entertainment in exchange for an honest review. This review has been hidden because it contains spoilers. To view it, click here. I did not enjoy this series. Bond’s actions, for the most part, are not Bond at all. Since when does Bond mow down a dozen defenseless people (even if they are bad guys)? Bond doesn’t take pleasure in killing and that’s what annoys me most. I didn’t feel many of these stories were all that connected either. He takes a bomb to the bottom of the river in #5 and he shows up at a bar in #6 and we’re told off-screen it was a dud bomb? What happened in between? I’be really enjoyed the Dynamite series I did not enjoy this series. Bond’s actions, for the most part, are not Bond at all. Since when does Bond mow down a dozen defenseless people (even if they are bad guys)? Bond doesn’t take pleasure in killing and that’s what annoys me most. I didn’t feel many of these stories were all that connected either. He takes a bomb to the bottom of the river in #5 and he shows up at a bar in #6 and we’re told off-screen it was a dud bomb? What happened in between? I’be really enjoyed the Dynamite series but this was the weakest by far.